After the disastrous experience of making Crimewave (1986) with their friend and fellow filmmaker Sam Raimi, the Coen brothers – Joel and Ethan – parted company with him and decided to make a film on their own. They returned to their hometown and raised $1.5 million themselves from private investors. The end result was the clever roman noir thriller Blood Simple (1985), which derived its name from Dashiell Hammet’s novel, Red Harvest, and described the crazed condition that a person reaches after killing someone. The film was an homage to the works of James M. Cain, a famous pulp writer of the 1940s who specialized in dark, brooding stories. Organized in the typical Cain triangle of husband-wife-lover, Blood Simple is a twisted tale of passion and guilt – as one critic described it, “equal parts film noir and Texas gothic.” The husband, Marty (Hedaya) owns a seedy roadhouse, his wife Abby (McDormand) decides to leave him, and becomes involved with one of her husband’s bartenders, Ray (Getz). When the two consummate their relationship in a nearby motel, a sleazy private detective named Visser (Walsh) captures the sordid affair on film, shows the incriminating evidence to Marty, and in the process sets the wheels in motion for the inevitable conflict. 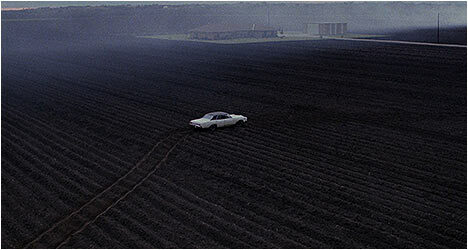 The real beauty of Blood Simple is how the Coens play with our perceptions. Only we get to see the whole picture, while the characters are confined to their own points of view, limited by their own perspective. This layering of P.O.V.s, that often complicates and contradicts one another, really sets Blood Simple apart from other contemporary noirs like Body Heat (1981). Blood Simple also contains many of what would soon become the Coen brothers’ characteristic film techniques, including their ear for realistic dialogue. They often listen to and record everyday conversations and use it in their films. Blood Simple premiered at the New York Film Festival to critical hoopla, winning a Grand Jury Prize at the United States Film Festival – one of the most prestigious awards for independent filmmakers. Many critics not only viewed the film as a triumph for the independent scene, but a brilliant motion picture that brought new life to a genre many thought extinct. And yet, Blood Simple is not simply a remake of an existing film noir but is rather inspired by them. Like its indie contemporaries, Jim Jarmusch’s Stranger Than Paradise (1984) and Spike Lee’s She’s Gotta Have It (1986), Blood Simple pulled in a respectable profit and heralded a new wave of American filmmakers who no longer felt the need to work within the constricting confines of Hollywood. The Coens’ film also drew the attention of major studios who realized that they would be stupid not to acquire such talent. This new transfer is better than the previous one out there with rich detail and colors that pop. Blood Simple has never looked better! “Shooting Blood Simple” features Joel and Ethan Coen, along with the film’s cinematographer Barry Sonnenfeld, talking about the way they shot this thriller over selected scene that runs 70 minutes. They laugh and point out mistakes they made along the way as well as reminiscing about principal photography. They also provide insight into low-budget filmmaking. “Conversation with Dave Egger” sees the author/screenwriter interviewing the Coen brothers about making Blood Simple. They start off with its origins and what they were doing before hand. They also talk about how they raised the money for the budget and the challenges of shooting in Texas. The Coens downplay the literary influences and briefly talk about how the story was based on real-life crimes. “Frances McDormand” is interviewed and she talks about how she got the part – originally, her good friend Holly Hunter was to be cast but she couldn’t do it. McDormand tried out and got the part. She gives her initial impressions of the Coens and their working methods. “M. Emmet Walsh” is also interviewed and talks about how he became an actor and his approach to acting. He points out that the Coens cast him based on his performance in Straight Time (1978). Walsh talks about how he got involved in Blood Simple and his approach to the character. “Sound and Music” features composer Carter Burwell and sound editor Skip Lievsay as they talk about working with the Coens and how they have worked with them ever since. They not only talk about working with them but also how they approach their respective jobs. “Fund-Raising Trailer” is what the Coens made to get potential backers to give them money to make the film. Finally, there are the original and re-release trailers.